Times are a changin’ indeed. In the old days we maintained a barrier between our work and our life. When we left the office, we left the office behind. It used to be that management told employees what time to clock in, what desk to work from, and measured performance by how late someone stayed in the office. Back then companies large and small signed long-term leases. That made sense because employees would retire after a 20 year career of working for the same company. Yesterday's "future of work" is today's modern workforce. Today the barriers between work and life have been torn down by technology and generational shifts. It's less about work-life balance and more about work-life blend. We’re more connected than ever before, and we embrace that when we’re passionate about the work we do. Now top talent gets to choose who they work for and for how long. We’re seeing an ever growing number in the contingent workforce as companies scale up and down, and forward thinking companies enable their most valuable assets to choose the best time and place to be productive and innovate. Companies globally are shifting to a more flexible approach to attract and retain top talent. Leaders are rising from the ranks of management to inspire results, not just manage performance. Never have we been more mobile, transient and “always on”. In a flexible working world, all this means massive changes to how we interact with and consume space. When creators are given a choice of where to work quite often we’re most productive in a private setting where we can focus. For many this means working remotely. But to innovate we also need face to face time with other creators and an atmosphere conducive to collaboration. Given the choice, creators will collaborate in environments specifically designed to stimulate thoughts and creativity. The challenge forward thinking companies face is how to provide the best work environment that talent needs, when they need it, whilst also enabling flexible working. As companies adopt flexible working, dependency on permanent office/desk space is dropping in favour of an agile approach. There is a shift in corporate real estate strategy as companies optimise their portfolios by incorporating flexible space. It used to be that leases sat outside of the balance sheet. Soon companies will have to report leases as long-term liabilities. 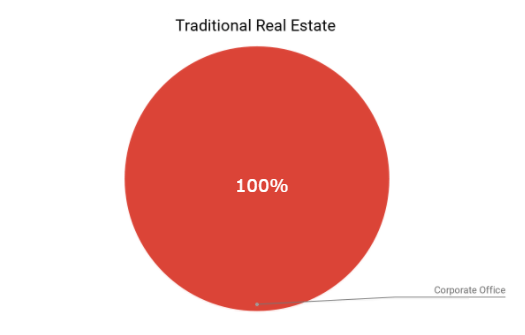 If your real estate footprint sees a significant variance in occupancy on a monthly, or even daily basis, it doesn’t make sense to manage your entire footprint on a fixed cost basis or invest in create spaces that may sit empty during off-peak periods. 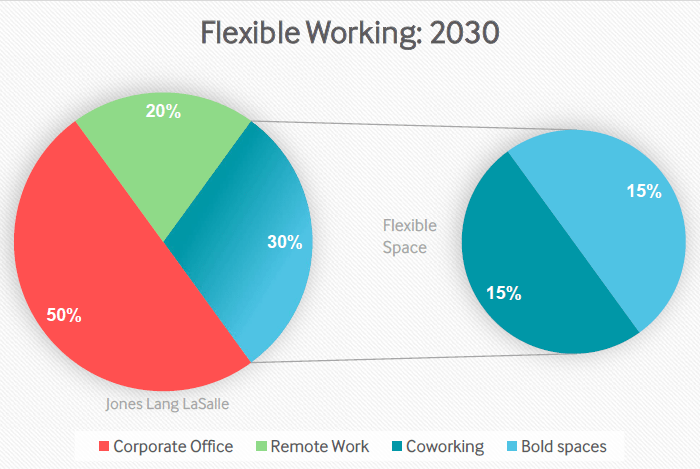 According to Jones Lang LaSalle, by 2030, 30% of corporate office footprints will consist of flexible space. We believe half of that will be made up of various types of coworking and serviced office solutions that can be scaled up or down on a monthly or annual basis. The other 50% will be consumed in daily or even hourly increments, and in 5 years time will be managed in the same way as corporate travel. This shift in corporate real estate strategy enables companies to both remain agile and give talent the environment it needs, when it needs it. But this new demand for flexible space consumption requires new business models from commercial real estate, a new asset class and a radically new valuation model. As space moves from product to service, we see a merger of hospitality and commercial real estate -- something we've predicted for several years now. Successful hospitality companies are customer service driven and deliver a consistent experience. In hospitality, BRAND MATTERS. So will be the case with Space-as-a-Service. Space-as-a-Service will become a new asset class, and will be valued and traded on, similar to that of successful hospitality companies. As Bob Dylan so eloquently put it, “you better start swimmin' Or you'll sink like a stone”. It used to be all about LOCATION LOCATION LOCATION. Landlords are used to being rent collectors. But in a rising tide of flexible working it’s all about SERVICE SERVICE SERVICE. Landlords who 'get it' will upgrade their buildings with Space-as-a-Service platforms like Bold while those who don’t get it will eventually "sink like a stone." After all, the future of work is flexible. Watch Antony Slumbers talk about the new Space-as-a-Service business model. If you think your building and occupiers would benefit from a Bold footprint, then why not contact us today and capitalize on the trends that are shaping the future of work?